Danny Phantom stands in the guard of peace of the simple people. He can deal with any threat, but now he got into the portal full of hostile ghosts that are trying to kill him. What will you do? 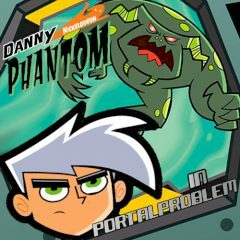 The was an issue with the portal and Danny Phantom decided to fix it. When he entered the portal he saw many ghosts around him and they all wanted to kill him. Fortunately, there are bonuses that you can collect and they will help you to deal with ghosts and the level bosses. Use your blaster to kill the villains and disappear to avoid their attacks.